© 2017 Paul et al. A novel drug delivery system for treating acute epileptic condition. To develop an intranasal mucoadhesive formulation of Lamotrigine (LTG) loaded insitu gel, for the treatment of epilepsy to avoid possible side effects and first pass metabolism associated with conventional treatment. Lamotrigine was loaded into different polymeric solutions of gellan and xanthan gum. All formulations subjected to various evaluation studies were within their acceptable limits. The pH of formulation ranges between 5.8 ±.001 to 6.8 ±.005 indicating that no mucosal irritation is expected as pH was in acceptable range. Invitro drug release from the mucoadhesive insitu gel formulations showed immediate drug release pattern with a maximum drug release of 97.02 ±0.54% for optimized G5 formulation within 20min. 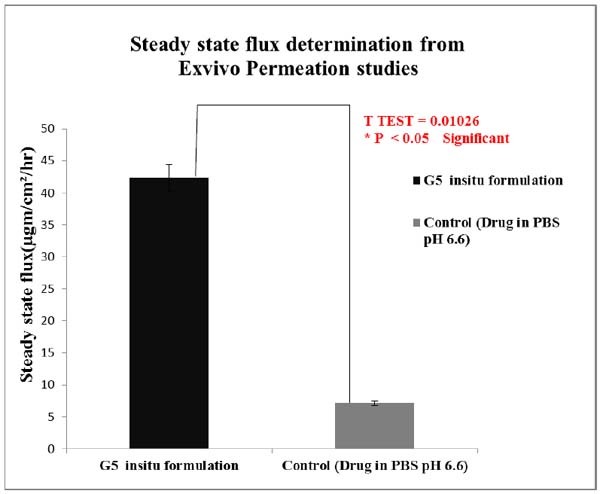 Exvivo permeation studies of optimized formulation G5 and control formulation was estimated. 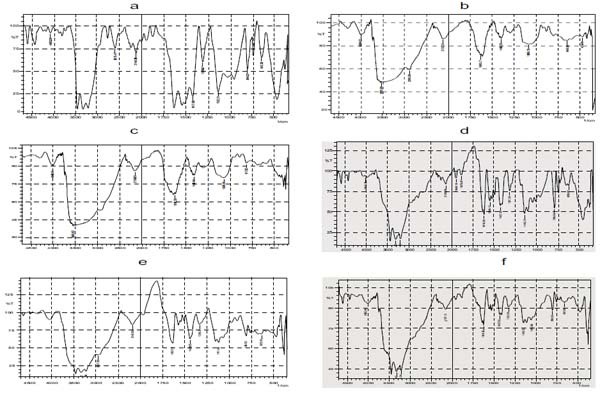 Exvivo permeation studies of G5 insitu formulation done for a period of 12 h resulted in slow, sustained release and greater permeability significance(P <0.05) through nasal mucosa when compared to control. Histopathological studies showed that G5 formulation was safer for nasal administration without any irritation. The stability studies indicated that gels were stable over 45 days in refrigerated condition (4±2ºC). The intranasal insitu gelling system is a promising novel drug delivery system for an antiepileptic drug lamotrigine which could enhance nasal residence time with increased viscosity and mucoadhesive character and provided better release profile of drug for treating acute epileptic conditions. Keywords: Intranasal formulation, Mucoadhesion, Insitu gel, Immediate release, Acute epileptic condition, Ex vivo permeation. Epilepsy is a neurological disorder of brain characterized by sudden recurrent episodes of sensory disturbances with brief loss of consciousness and awareness, which ultimately lead to seizures. Epileptic seizures are undetectable and can vary from short to long periods of vigorous shaking, to loss of body functions and motor functions and to mood swings. In epilepsy, seizures tend to recur and have no immediate underlying cause . Epileptic seizures are the result of excessive and abnormal nerve cell activity in the cortex of the brain. Pathophysiology of epilepsy is partially understood . Some occur as a result of tumour of brain, brain injury and brain defect stroke. About 50 million people have epilepsy worldwide. Seizures can be controlled with medication in about 70% cases otherwise surgery, dietary changes and neurostimulation should be considered. AEDs (Antiepileptic drugs) are the medications used in the treatment of epileptic seizure, some of them act by targeting the voltage gated Na+ (sodium) and Ca+ (calcium) channel while some act in stimulating GABA system. Selection of AED for a patient depends upon the affected individual’s condition and side effects of drug. This article mainly helps in evaluating and developing an insitu gel loaded with lamotrigine. The reason for selecting intranasal insitu drug delivery is because of its large surface area for drug absorption, as it avoids first pass metabolism and it help in delivering drug to CNS thereby by passing BBB, there is rapid onset of pharmacological action and higher bioavailability of lipophilic drugs like lamotrigine. Insitu delivery system favours the ease and convenience of administration as drops allowing accurate dosing. Mucoadhesive system aims in targeting and localization of the dosage forms and provide an intimate contact between dosage form and absorptive mucosa resulting in high drug flux at the absorbing tissue. It’s a novel drug delivery system since lamotrigine was only available as tablet (chewable, disintegrating, extended release) and IV formulation. Intranasal insitu gel is developed for the purpose of immediate release of lamotrigine for treating acute epileptic condition, which is very essential in treating an emergency condition [3-24]. Lamotrigine was provided as a gift sample by Auro Bindo Pharma private limited, Hyderabad. Gellan gum was obtained from Marine Hydrocolloids, Kochi. Dialysis membrane (12000-14000 mol. Wt. Cut off) was procured from Sigma Aldrich. Preformulation investigations are intended to convey all essential data, especially physico-chemical, physico-mechanical and biopharmaceutical properties of drug substances and its excipients as well as its compatibility. FTIR spectrum of the obtained pure drug of Lamotrigine was compared with the FTIR of the standard drug spectrum (from monograph, IP). FTIR spectrum was obtained by using FTIR spectrophotometer by KBr (potassium bromide) pellet method. Solubility studies of drug lamotrigine) was determined in different solvents such as water, ethanol, methanol, 1-propanol, acetone and 1-butanol and in phosphate buffer (PBS) pH 6.6 to find the solvent in which lamotrigine is completely soluble, so as to give a better absorption curve of lamotrigine in UV spectrophotometer. The purity of the sample is indicated by its melting point. The presence of relative slight amount of impurity will decrease the melting point. Open capillary method was used to determine the melting point of sample. Partition coefficient = Concentration of drug in organic layer/ Concentration of drug in aqueous phase. Absorption maxima of lamotrigine was determined in solvent methanol. Standard stock solution is prepared by dissolving 10mg (Milligram) of lamotrigine in 30ml (Millilitre) methanol by sonication for 10 minutes and volume was made up to 100ml mark using methanol. The concentration of standard stock solution is 100µg/ml (Microgram per millilitre). This was scanned from 400-200nm by using UV spectrophotometer. Absorption maxima of lamotrigine was determined in solvent PBS pH 6.6. Standard stock solution was prepared by dissolving 10mg of lamotrigine in 30ml PBS pH 6.6 by sonication for 10 minutes and volume was made up to 100ml mark using PBS pH 6.6. The concentration of standard stock solution was 100µg/ml. This was scanned from 400-200nm by using UV spectrophotometer. It is very important to carefully select the excipients to develop an effective, stable and optimised dosage form to facilitate easy administration, promote the better release and bioavailability of drug and to protect it from degradation. The compatibility study of drug lamotrigine and excipients is very important. The drug excipient compatibility study was performed by preparing a homogenous physical mixture of drug and all possible excipients to be used in formulation in the ratio 1:1. FTIR spectra of drug and excipients were obtained to ascertain the compatibility between lamotrigine and selected polymers using FT infrared spectrophotometer by KBr pellet method. XRD studies are the most powerful and established technique for material structural analysis, capable of providing information about the structure of a material at its atomic level. X-Ray diffraction studies pattern was recorded for a specified quantity of pure drug and optimised formulation (G5) on X-ray diffractometer (Model –Bruker AXS D8 advance, Configuration – Vertical theta /2 theta geometry, Angle range - 360˚, X Ray source - Cu, Wavelength - 1.5406 ˚A, Detector – Si (Li) PSD, Temperature range -170˚C - 450˚C). The XRD pattern of insitu gel formulation was compared with that of the pure drug. Calibration curve was done using methanol and PBS pH 6.6. 10mg of lamotrigine in 30ml of methanol was sonicated for 10 minutes and the volume was made up to 100ml mark using methanol. The drug was dissolved and diluted with methanol to get concentration of 100µg/ml. From this stock solution(100µg(microgram)) different aliquots 0.5ml,1ml,1.5ml,2ml and 2.5ml were drawn and diluted to 10ml with methanol separately to prepare a series of concentration from range 5-30µglml. The standard stock solution (100µglml) was scanned in the range of 400-200nm against methanol as blank. Standard graph was obtained by plotting absorbance against concentration (µg/ml). Preparation of PBS pH 6.6 solution 2.712g (gram) of potassium dihydogen ortho phosphate was dissolved in 100ml distilled water and 0.8g of sodium hydroxide (NaOH) was dissolved in 100ml distilled water separately. From the prepared solutions, 25ml of potassium dihydogen ortho phosphate and 8.2ml of NaOH were pipetted into 100ml standard flask and volume was made up to 100ml mark using distilled water. 10mg of lamotrigine in 30ml of phosphate buffer was sonicated for 10 minutes and the volume was made up to 100ml mark using PBS. Using PBS the drug was dissolved and diluted to get a concentration of 100µglml. From this stock solution (100µg) different aliquots were drawn and diluted to 10ml with PBS separately to prepare a series of concentration from range 5-30µglml. The standard stock solution (100µglml) was scanned in the range of 400-200nm against PBS as blank. Standard graph was obtained by plotting absorbance against concentration (µg/ml). Polymeric solution of gellan gum and xanthan gum was prepared using deionised water and mixed with mechanical stirrer for 2 min. Preservatives, such as ethyl paraben, mannitol and Polyethylene glycol (PEG), were added into polymeric solutions, and then kept in a water bath for few minutes. Then, it was cooled to room temperature. Drug was then mixed with small amount of methanol and then sonicated. Drug solution was added to beaker containing polymeric mixture which was then continuously stirred until the entire drug was dissolved. The prepared formulation was transferred to a clean glass container which was made up to 10ml volume with distilled water and stored in a cool place. Table 1 gives the composition of insitu gel of lamotrigine. Table 1. Composition of different formulation of intra nasal insitu gel of Lamotrigine. All the prepared formulations were inspected for homogeneity studies by visually observing the appearance and the presence of lumps in the formulation. The system exists in sol form before administration and after administration it turns into gel form. Gelling time is the time taken for the transformation of sol to gel form. Time for gelation is recorded by placing 2ml of prepared solution in a test tube and adding small amount of simulated nasal fluid, maintaining the temperature at 37ºC and visually observing the gel formation, and onset of time for gelation is recorded as gelling time in seconds. Syringeablity test was performed by transferring freshly prepared formulations into an identical 5 ml plastic syringe placed with 20 gauge needle to a constant volume (1 ml). The solutions which were easily passed from syringe weretermed as pass and difficult to pass were termed as fail. One ml of the prepared insitu gels was diluted with distilled water. A Digital pH meter (Shambhavi Impex, India) which was previously calibrated was used for determination of pH of the resulting solution. Spreadability was determined by placing excess of sample insitu gel between two glass slides and for 5 min under tension by placing 1000g weight, the slides were compressed to uniform thickness. Spreadability is the time in seconds for two slides to slip off from insitu gel which was placed in between the slides. The slides are under the influence of certain load. The spreadability is expressed in g cm sec-1 (gram centimetre/seconds). Gel strength was determined by using texture analyser (Model – TA.XT2 Plus, Size- 650mm tall, 540mm deep, 280mm wide, Speed – 0.01- 40mm/sec, Maximum aperture -370mm,Sample testing area- 247mm x 228mm, load cell capacity - 3g- 10kg, Operating temperature- 0-40˚C). The experiment was done by placing insitu gel in standard beaker below probe. In this, an analytical probe was depressed into the sample. The texture analyser was set to gelling strength test mode or compression mode with test speed of 1.0mm/sec, an acquisition rate of 50 points per sec and trigger force of 3-5g were selected. An aluminium probe of 7.6cm diameter was used for all the prepared formulations. The study was carried out at room temperature and the force required to penetrate the gel was measured as gel strength in grams. Viscosity of insitu gel system was determined using Brook field viscometer DV-1 prime and Pro couple with S-94 spindle. Temperature of 37±0.5ºC was maintained and the spindle was lowered perpendicularly into both insitu sol and gel formulations which were placed in a beaker. The viscosity of each formulation was determined by applying 100rpm speed. The measurement of viscosity of prepared insitu gel was done with Brookfield viscometer. The insitu formulations were rotated for 2 minutes at different speeds for selected spindle. At each speed the corresponding dial reading was noted. The viscosity of different insitu gel formulations was measured at different speeds at room temperature. A typical run should be carried out by changing the speed from 10-100 rpm (revolutions per minute). Suitable dilutions of drug in PBS was made by dissolving 1ml of formulation in 10ml PBS of pH 6.6 which was taken in 10ml volumetric flask. The drug content was estimated on UV visible spectrophotometer at 309nm using PBS pH 6.6 as blank. Invitro mucoadhesion studies were performed to evaluate the mucoadhesion properties of insitu gel loaded with lamotrigine. The time required for the detachment of insitu gel spread on the nasal mucosa was determined. The tissues were kept in PBS and stored in freezer and the same was kept at room temperature before doing the test. Sections of nasal mucosa were fixed onto a glass beaker with mucosal surface facing outwards. A small quantity of nasal insitu formulation was placed on the mucosal surface previously treated with simulated nasal fluid. Mucosa fixed on to the glass beaker was then placed in the beaker containing 100ml of PBS and was magnetically stirred at 10 rpm. The time required for erosion of insitu gel was noted visually and considered as the invitro mucoadhesion time. The force used to detach the insitu gel placed in between the two nasal mucosae was determined with the help of a specialised chemical balance. The nasal mucosa mainly the bovine mucosa is used for the study. On one side of the balance the nasal mucosa is tied on a clear glass surface with help of a rubber band and another mucosa was placed in such a way that the mucosa is in inverted position to that of the first, so that both the mucosal surfaces face each other. A small quantity of the prepared insitu gel about 50mg is placed in between the two mucosae and allowed to remain in contact with each other for few minutes. For each measurement using different formulation, different mucosa was used. On the other side of the pan, weight was increased until the two mucosae were detached from each other. Mucoadhesive strength is expressed as force or stress detachment per cm square of area of mucosa used. Where m=Weight in grams required for the detachment of two mucosae. g =acceleration due to gravity. Invitro drug release study was performed by static dissolution method. In vitro drug release was carried out by placing the prepared insitu gel formulations in a beaker containing the 50ml of PBS pH6.6. The temperature was maintained at 37±0.5ºC throughout the study. Gel form was initially prepared by treating the in situ formulation with simulated nasal fluid (composition include sodium chloride -0.745gm, potassium chloride -0.12gm, calcium chloride dehydrated- 0.005mg distilled water -100ml)which was then placed in the beaker containing PBS. Then beaker was placed on magnetic stirrer and stirred for adequate period of time. Aliquots of samples were withdrawn at regular intervals and the dissolution medium was replaced with fresh PBS. The samples withdrawn were suitably diluted with PBS pH6.6 and the amount of drug released was analysed spectrophotometrically at 309nm against PBS pH 6.6 as blank. After the in vitro release studies, the formulation with maximum release was found and the kinetic studies were done by subjecting the release data of the optimised formulation to different kinetic models and calculated the corresponding regression coefficient values (R2). Franz diffusion cell was used for doing the exvivo permeation study. The diffusion cell has receptor compartment of 15ml capacity which was filled with PBS of pH6.6. Bovine nasal mucosal tissue used in ex vivo permeation was obtained from local slaughter house and cut in suitable shape. Bovine mucosa was selected since it resembles human nasal mucosa. Mucosal tissue was properly placed over the receptor compartment. From 20 mg containing 10ml of optimised formulation 1ml of in situ gel formulation was placed in the donor compartment. Aliquots of samples were withdrawn from the receptor compartment at regulator intervals and fresh samples were replaced into receptor compartments. Samples were suitably diluted and drug content was analysed spectrophotometrically at 309nm. The permeation study was done for optimised G5 insitu formulation and control containing drug in PBS pH 6.6 and comparison was done among them for steady state flux value for a maximum period of 12h. Statistical analysis of the data was carried out by performing Students T Test. 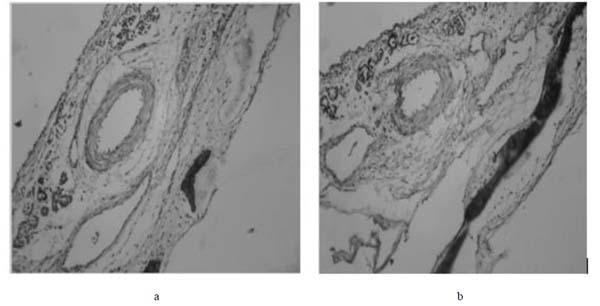 The pre-treated mucosa after in vitro permeation was subjected to histopathological examinations for knowing any changes after accepted procedure. Nasal mucosa treated with control and optimised G5formulation were subjected to histopathological examination using a light microscope. 10% buffered formalin (pH 7.0) used to fix tissue was routinely processed and embedded in paraffin. Sections (5 µm) were cut on glass slides and stained with hematoxylin and eosin. The optimised insitu G5 formulation was suitably diluted and examined with SEM. The optimised insitu G5 formulation was subjected to TEM, in which a beam of electrons was transmitted through the sample to form an image. The optimised insitu gel formulation (G5) underwent stability evaluation for 45 days in refrigerated (4±2ºC), room temperature (30±2ºC) and oven (40±2ºC) conditions and analysed for drug content and gel strength at regular intervals. Mean values were recorded. FTIR of pure drug lamotrigine in Fig. (1) was found to be in accordance with monograph (IP). Fig. (1). FTIR spectrum of sample lamotrigine. The pure drug is partially soluble in water and ethanol and completely soluble in methanol, acetone, PBS pH 6.6. The melting point of the drug was found to be 225-235 °C and it was in accordance with that of the reference. Partition coefficient of the drug was found to be 1.1 indicating that the drug is practically insoluble in water and has high lipophlilicity. Fig. (2). a) Absorption maxima of lamotrigine in methanol; and b) Absorption maxima of lamotrigine in PBS pH 6.6. The absorption maxima of lamotrigine in methanol was found to be 309nm as shown in Fig. (2a), which was in accordance with the official standard. The absorption maxima of lamotrigine in PBS pH 6.6 was found to be 309 nm (Fig. 2b). FTIR spectra of lamotrigine, gellan gum, xanthan gum, drug with gellan gum, drug with xanthan gum, insitu gel formulation are shown in (Fig. 3). Fig. (3). 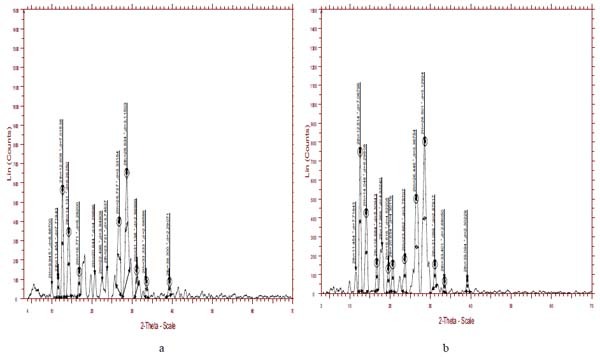 FTIR spectra of a) lamotrigine; b) gellan gum; c) xanthan gum; d) drug with gellan gum; e) drug with xanthan gum; and f) in situ gel formulation. FTIR spectra of Lamotrigine shown in Fig. (3a) showed characteristic absorbance at 3446 cm-1 specifying NH stretching of amino group, 3211cm-1 shows aromaticity (aromatic CH stretching), 1627 cm-1, 1417cm indicates C=C ring stretching, and 843.02 cm-1 shows C-Cl stretching of halides . FTIR spectra of gellan gum shown in Fig. (3b) showed a broad strong peak at 3525 cm-1 indicating the presence of OH group, and 2891cm-1 shows aromatic CH stretching. FTIR spectra of Xanthan gum shown in Fig. (3c) also showed a broad peak at 3549 cm-1 which also relieved the presence of OH group. 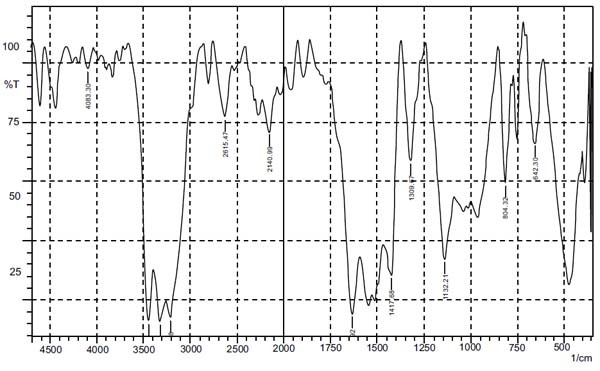 FTIR spectra of insitu gel formulation exhibited a sharp peak at 3315 cm-1 which unveiled the existence of amino group (NH stretching of NH group), 325.34 cm-1 indicates aromatic CH stretching, 1627 cm-1, 1427cm-1 shows C=C ring stretching, 798-659 cm-1 displays C -Cl stretching of Halides, and a strong absorbance peak at 3445 reveals the presence of OH group. Absence of extra peaks indicates good compatibility between drug and excipients. The XRD pattern of both insitu formulation and lamotrigine is shown in Figs. (4a and 4b), respectively. The characteristic XRD patterns demonstrate the crystalline nature of lamotrigine. XRD pattern of lamotrigine has sharp and intense peak appearing at 12.1, 13.2, 24.9, 27.5 2 theta values. While comparing the XRD pattern of drug with the insitu formulation, the latter showed a decrease in the intensity and number of peak. This clearly indicates the degree of amorphous nature of formulation. The crystalline nature of lamotrigine was reduced in the insitu formulation. Fig. (4). a) XRD pattern of insitu formulation; and b) XRD pattern of drug lamotrigine. The calibration curve of lamotrigine in methanol was found to be linear in concentration range of 5-30 µg/ml. The calibration curves are shown in (Fig. 5a). Fig. (5). a) Standard calibration curve of lamotrigine in methanol, b)Standard calibration curve of lamotrigine in phosphate buffer pH 6.6. The calibration curve of lamotrigine in phosphate buffer pH6.6 was found to be linear in concentration range of 5-30µg/ml. The calibration curves are shown in (Fig. 5b). All the prepared in situ gels showed noble homogeneity with the absence of lumps indicating uniform drug distribution of the formulation. The gelling time of the formulation ranged between 3.4 ± 0.21 sec and 11.3 ± 0.22 sec. The formulations G5 showed an adequate gelling time. Gelling time of all formulations is mentioned in Table 2 and Fig. 6a. Table 2. Gelling time, Syringeability, pH, Spreadability, Gel strength, and Viscosity of different insitu gel formulations. Fig. (6). a) Showing gelling time; b) pH; c) Spreadability; d) Gel strength of different formulations of insitu gel of lamotrigine. All the formulations from G1- G5 passed syringeability test and showed good syringeability except G6 and G7as shown in Table (2). Syringeablity test was conducted for ensuring that the prepared formulation was having proper solution flow nature so that the formulation can be used to deliver the insitu sol to the target site. The syringeability depends on 3 parameters mainly viscosity of the system, flow rate, and needle characteristics. Syringeablity mainly depends on the concentration of the polymer and viscosity. Since the former ones especially G5 and G4 were having lesser polymer concentration which exhibited good Syringeablity. As the polymer concentration was increased the syringeability was reduced. pH value of all insitu gel formulation ranged in between 5.8-6.4, indicating that the formulation was suitable and better for nasal administration with reduced irritation of tissue. pH of all the formulations is given in Table 2 and Fig. (6b). The formulated insitu gel exhibited satisfactory spreadability indicating easy application of drug. The spreadability of the optimised insitu formulation was in the range of 34.33±1.42 g cm /second. Spreadability studies were shown in Fig. (6c and Table 2. 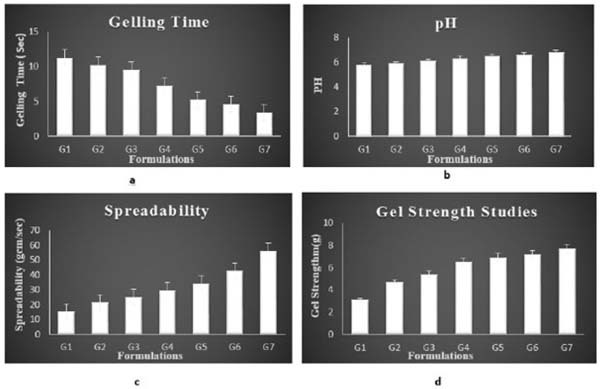 Gel strength of different insitu gel formulation was in the range of 3.1±0.56 g and 7.7 ± 0.45 g as given in Fig. (6d) and Table 2. One important pre-requisite for intranasal in situ gel was viscosity of the formulation. As indicated, a formulation suitable for application to the nasal cavity should ideally have a low viscosity when applied and after administration should have a high viscosity in order to stay at the application site. All the formulations of batches G1– G7 showed a polymer concentration dependent rise in viscosity. Viscosity of the both insitu sol and insitu gel was examined at 100rpm. G7 formulation was having maximum viscosity. The viscosity of G5 formulation was taken as optimum. Viscosity of insitu sol formulation ranged between 19± 0.27- 80.26± 0.53 cps. Viscosity of insitu gel ranged between 93± 0.52 to 218± 0.63 cps as shown in Fig. 7a and Table (2). This is an important parameter for the in situ gels to be evaluated. This study excluded G6 and G7 formulations since these formulations do not have sufficient syringeability and such formulations are avoided because of difficulty in administration. The viscosity of formulations should be in an optimum range which improves its ease of administration. The flow curve (viscosity against speed / rpm) of selected formulations indicated that for the selected polymer concentrations, pseudoplastic systems with shear thinning property were obtained. The prepared formulations tend to thin when being exposed to shearing force. Fig. (7b) compares the shear dependent viscosity of prepared formulations containing gellan gum and xanthan gum. The drug content was estimated for all prepared in situ gel formulation. Acceptable range of drug content in the range of 86.12± 0.32% - 97.6 ± 0.68% was present in all of them indicating uniform distribution of drug. The maximum amount of drug was present in G5 formulation with 97.6 ± 0.68%. The concentration of drug content proportionally depends on polymer concentration, But when polymer concentration is too high the concentration of drug was slightly less when compared to the former ones. The drug concentration was estimated to be maximum when 1.75%w/v of polymer was used. Drug content estimation was given in Table 3. Table 3. 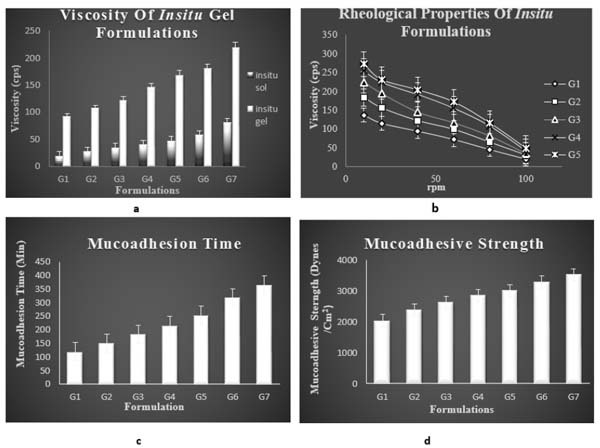 Drug content, Mucoadhesion time, and Mucoadhesive strength of different in situ gel formulations. Fig. (7). a) Viscosity; b)Rheological properties; c) Mucoadhesion time; d) Mucoadhesive strength of different formulations of in situ gel of lamotrigine. Mucoadhesion time taken for the insitu gel to erode from the nasal mucosa was noted. The adhesion time taken for G5 formulation was found to be higher than other formulation. Mucoadhesion is imparted by the formulation due to the addition of a natural mucoadhesive polymer gellan gum. Bioadhesive time was found to be increasing with raising concentration of gellan gum. Higher mucoadhesive time of optimised formulation indicates that it can be attached to the nasal mucosa for longer period with less risk of mucocilliary clearance and provides a sustained effect. Mucoadhesive time of all the formulations is mentioned in Table 3 and Fig. (7c). The spreading and swelling of formulation when the mucoadhesive polymer binds to mucous membrane mark the first stage, i.e contact stage. The next stage is the activation of mucoadhesive polymer, which is due to the interaction of mucoadhesive polymer with the ions present on the nasal mucosa. Mucoadhesion studies were carried out to ensure that the formulation had the ability to adhere to the mucous membrane at the site of absorption for a long period of time. With increase in polymer concentration a raise in mucoadhesion was seen. The mucoadhesive character is exhibited by the polymer gellan gum, by interaction of the specific functional groups in polymer like hydroxyl and carboxyl group with the glycoprotein chain in the mucous layers of epithelial cells of nasal cavity. The interactions can be strong or weak like wander walls interaction, ionic bonding and hydrogen bonding. The polymer is an ion activated one which upon interaction with the physiological ions in the nasal electrolytes form gel. The interaction of the polymer with the glycoprotein chains in the mucin network occurs when the polymer swells by absorbing water from the mucous layer and adhesion binding occurs to form gel. The key factors that play a major role in mucoadhesion are the physiological ions in the nasal cavity as well as the swelling capacity of the polymer which finally result in prolonged mucoadhesion and reduced mucocilliary clearance. Mucoadhesive strength of all the formulations is mentioned in Fig. (7d) and Table 3. The in vitro release studies of different formulations of drug loaded in situ gels were carried out for 20minute in PBS pH6.6. PBS of pH6.6 was selected as medium for drug absorbance since it resembles nasal pH. Throughout the study the pH and temperature were kept constant. The maximum release was found to be for G5 and G4 with respective release of 97.02 ± 0.54% and 95.96 ±0.16%. The polymer concentration plays a key role in release pattern of drug. The release of drug mainly depends on the polymer concentration. Polymer concentration was proportional to release to some extent. But too high concentration of the polymer can adversely affect the in vitro release as in formulation G7. The G5 formulation was showing highest percentage release and was regarded as the optimised formulation. The drug: wax ratio was optimum for the G5 formulation which was the reason for its immediate release. Fig. (8) shows the in vitro release of different in situ gel formulations. Fig. (8). 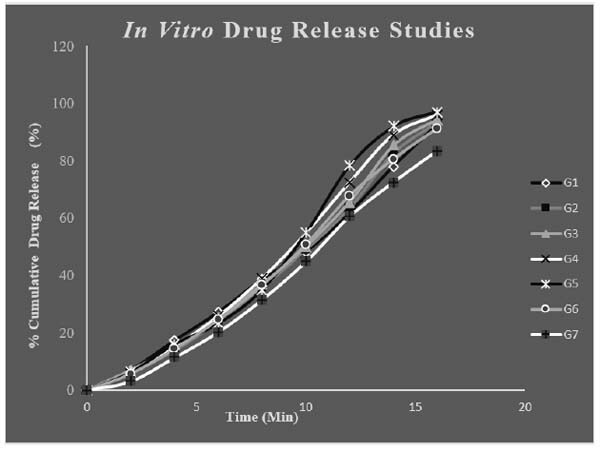 In vitro drug release studies of different in situ formulation. Fig. (9). 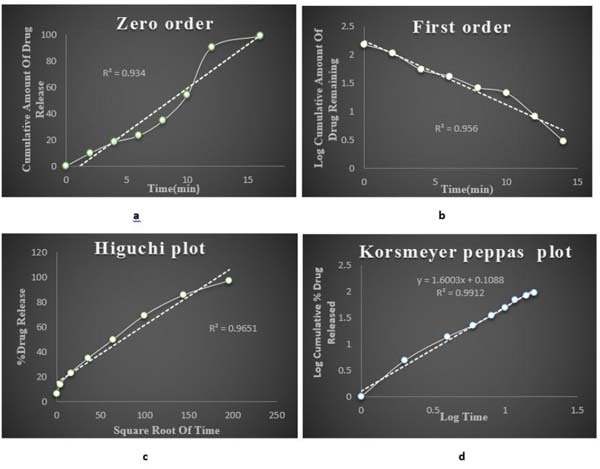 (a) Zero order kinetics; (b) first order kinetics; (c) Higuchi plot; (d) Korsmeyer peppas model. Franz diffusion cell was used for conducting exvivo permeation studies. The permeation studies were conducted by using bovine nasal mucosa for 12 hours. The bovine nasal mucosa was selected because of its physiological resemblance to human nasal mucosa. The nasal mucosa represents a layer with higher vascularisation. 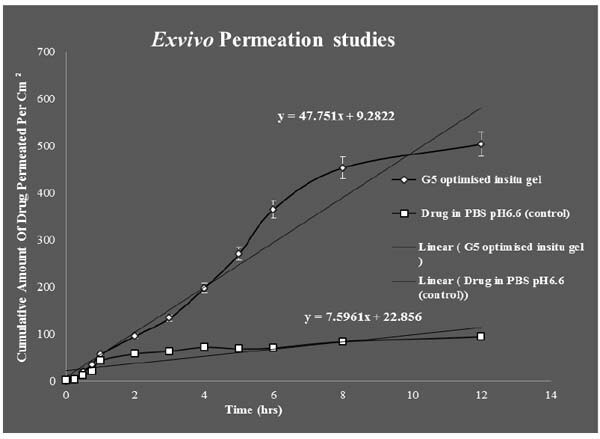 The exvivo permeation study was done for optimised G5 formulation and control formulation containing the drug in PBS pH6.6 and comparison studies done between them were plotted on a graph. G5 optimised formulation was showing maximum permeation than control indicating slow and sustained permeation of drug from nasal mucosa. The release process of the drug from the preparation depends on the dissolution from the gel in aqueous media and more viscous gels release lamotrigine more slowly than less viscous solutions. These results indicate that the viscosity of the insitu gel plays an important role in controlling the release of the drug if the dissolution of the drug through the polymer matrix is a rate determining step. The exvivo permeation studies of the above mentioned two formulations are given in (Fig. 10). Fig. (10). Ex vivo permeation studies of G5 insitu optimised gel and control formulations. Fig. (11). Steady state Flux determination from exvivo permeation studies of optimised G5 formulation and positive control. Students T Test were carried out for statistical analysis of data and the P value was 0.0126 which was significant, since p value is < 0.05.Statistical analysis showed significant improvement in the exvivo permeation of the optimised G5 insitu formulation than when compared to control. Ex vivo studies revealed that amount of lamotrigine permeated per cm2 was improved significantly (P < 0.05) for G5 formulation than when compared to positive control. The permeability coefficient and steady state flux values of the G5 insitu optimised formulation were higher than the positive control. Fig. (11) shows comparison of steady state flux between the optimised insitu G5 formulation and control containing drug in PBS at pH 6.6. Fig. (12a and 12b) shows the histopathological study of nasal mucosa after permeation with optimised G5 formulation which does not cause any irritation or toxicity and was safe for nasal administration. Fig. (12). Histopathological evaluation of nasal mucosa. a) Normal mucosa; b) Mucosa treated with optimised formulation. SEM studies Fig. (13a) show discrete, spherical shaped with a rough outer surface. Visible wrinkles are shown in the SEM studies. The shape and morphology of the insitu gel formulation can be studied by TEM image. TEM image of the lamotrigine loaded insitu gel formulation is shown in Fig. (13b), indicating spherical particles in nanometre range which are homogeneously distributed throughout the formulation. Parameters like drug content and gel strength were evaluated from 0 day to 45 days at regular intervals in 3 different conditions i.e, refrigerated, room temperature and oven conditions. The optimised G5 insitu gel formulation was found to be more stable at refrigerated and room temperature conditions than in oven condition. Table 4 and Fig. (14a) a show the drug content and Table 4 and Fig. (14b) show gel strength of optimised in situ G5 formulation during stability studies over a period of 45 days. Fig. (13). a) SEM image of lamotrigine loaded insitu gel formulation; b) TEM image of Lamotrigine loaded insitu gel formulation. Fig. (14). 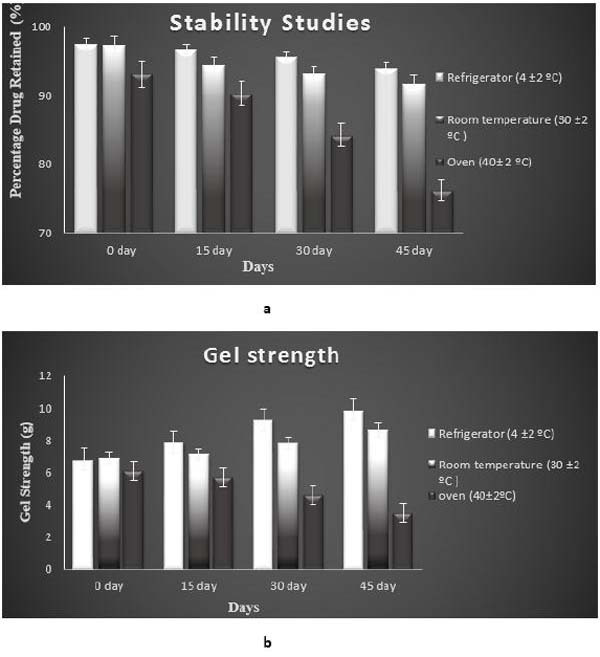 a) Drug content; b) Gel strength of optimised insitu gel G5 formulation during stability studies at different conditions. Table 4. Stability studies of optimised G5 insitu gel formulation. Epilepsy is a common chronic neurological disorder characterized by recurrent epileptic seizures. A number of delivery systems have been investigated but still a novel delivery system to combat this incurable firing disorder is yet to be developed. Intranasal drug delivery is one of the local drug delivery routes to combat this neurological disorder due to high vascularisation, larger surface area and porous endothelial membrane providing systemic effect and avoidance of first pass metabolism. It is also a non-invasive route. Antiepileptic drugs commonly used in treating epilepsy especially in conventional treatments are probably associated with many side effects. The main purpose of this study was to formulate an insitu gel drug delivery system with immediate release for treating epileptic condition that can minimize first pass metabolism and side effects by loading lamotrigine into different concentration of natural biodegradable polymeric solutions of gellan gum and xanthan gum that increases the mucoadhesion and residence time, reducing the mucocillary clearance and are also responsible for gelling property of the formulation. Among all the formulation G5 was fixed to be the optimised formulation, which had maximum drug release of 97.02±0.54% and greater permeation significantly (p < 0.05) than control. Histopathological studies showed there is no alteration in drug treated nasal mucosa after permeation with optimised formulation when compared with normal nasal mucosa, this indicates less irritation to the nasal mucosa. Administration of drug loaded insitu gel formulation into nasal cavity proves to be viable and effective alternative to other conventional therapy and in future its clinical use is promising. Wallace H, Shorvon S, Tallis R. Age-specific incidence and prevalence rates of treated epilepsy in an unselected population of 2,052,922 and age-specific fertility rates of women with epilepsy. Lancet 1998; 352(9145): 1970-3. More BA, Mene HR, Pawar RK, Misal NS, Pathak SS, Shivsharan KJ. A Review on insitu Nasal Gel Drug Delivery system. Int J Pharm Sci Rev Res 2015; 33(1): 199-207. Vinayan KP, Solomon LM. Neonatal seizures and epilepsies. Int J Epilepsy 2014; 1: 75-83. Chaundhar SP, Chaundhar PP, Kolsure PK, Barhate NS, Despande AD. Preformulation study of sumatriptain succinate nasal gel. Ind Drugs 2006; 43: 966-71. Nirmal HB, Bakliwal SR, Pawar SP. Insitu gel -New trend in controlled and sustained drug delivery system. Int J Pharm Tech Res 2010; 2: 1398-408. Mathison S, Nagilla R, Kompella UB. Nasal route for direct delivery of solutes to the central nervous system: Fact or fiction? J Drug Target 1998; 5(6): 415-41. Schipper NG, Verhoef JC, Merkus FW. The nasal mucociliary clearance: relevance to nasal drug delivery. Pharm Res 1991; 8(7): 807-14. Illum L. Transport of drugs from the nasal cavity to the central nervous system. Eur J Pharm Sci 2000; 11(1): 1-18. Watts P, Smith A. PecSys: In situ gelling system for optimised nasal drug delivery. Expert Opin Drug Deliv 2009; 6(5): 543-52. Czapiński P, Blaszczyk B, Czuczwar SJ. Mechanisms of action of antiepileptic drugs. Curr Top Med Chem 2005; 5(1): 3-14. Umesh GH, Kumar H, Mishra G, Sharma AK, Gothwal A, Kesharwani P. Intranasal drug delivery: A Noninvasive approach for the better delivery of Neurotherapeutics. Pharma Nanotechnol 2017; 5(4): 1-12. James E, Kuriakose S, Kumar A. Assessment of knowledge of epilepsy in epileptic patients attending a tertiary care centre in Kerala. Int J Pharm Pharm Sci 2014; 6(7): 64-7. Ramesh K, Krishnapriya M. Anupriya, Nair, SC. An outlook to nonpharmacological and novel approaches to combat the uncurable firing disorder. Int J Pharm Sci Rev Res 2016; 40(1): 55-61. Patil SB, Sawant KK. Chitosan microspheres as a delivery system for nasal insufflation. Colloids Surf B Biointerfaces 2011; 84(2): 384-9. Madan M, Bajaj A, Lewis S, Udupa N, Baig JA. In situ forming polymeric drug delivery systems. Indian J Pharm Sci 2009; 71(3): 242-51. Talegaonkar S, Mishra PR. Intranasal delivery: An approach to bypass blood brain barrier. Indian J Pharmacol 2004; 36(3): 140-7. Krishnapriya M, Ramesh K, Nair SC. Antiepileptic rectal hydrogel loaded with carbamazepine – Rice bran wax microspheres. Asian J Pharm Clin Res 2017; 10(3): 264-70. Appasaheb PS, Manohar SD, Bhanudas SR. A Review on intranasal drug delivery. J Adv Pharm Educ Res 2013; 3: 334. Arora P, Sharma S, Garg S. Permeability issues in nasal drug delivery. Drug Discov Today 2002; 7(18): 967-75. Chajed S, Sangle S, Barhate SD. Advantagious nasal drug delivery system: A review. Int J Pharm Sci Res 2011; 2(6): 1322-36. Swamya NG, Abbas Z. Mucoadhesive insitu gels as nasal drug delivery systems: An overview. Asian J Pharm Sci 2012; 7(3): 168-80. Kute JU, Darekar AB, Saudagar RB. Insitu gel-novel approach for nasal delivery. World J Pharm Pharm Sci 2013; 3(1): 187-203. Chaudhary B, Verma S. Preparation and evaluation of novel insitu gels containing acyclovir for the treatment of oral herpes simplex virus infections. Sci World J 2014; 280. Wilmshurst JM, Gaillard WD, Vinayan KP, et al. Summary of recommendations for the management of infantile seizures: Task force report for the ILAE commission of pediatrics. Epilepsia 2015; 56(8): 1185-97. Jain SK, Jain A, Gupta Y, Ahirwar M. Design and development of hydrogel beads for targeted drug delivery to the colon. AAPS Pharm Sci Tech 2007; 8(3): E56. Fahim F, Naseer A, Ahmed S, Sherazi ST, Bhanger MI. A green approach for the determination of selected anti diabetic drugs in pharmaceutical formulation by transmission FTIR spectroscopy. J Braz Chem Soc 2014; 25(11): 2032-8. Nasra MM, Khiri HM, Hazzah HA, Abdallah OY. Formulation, in-vitro characterization and clinical evaluation of curcumin in-situ gel for treatment of periodontitis. Drug Deliv 2017; 24(1): 133-42. Swati R, Sandeep W, Swaroop L. Insitu gel formulation of ornidazole for the treatment of periodontal disease. Curr Pharm Res 2010; 1(1): 60-9. Prasad KM, Ravindranath BS, Sheetal BG. Nasal insitu gel: A novel approach for nasal drug delivery system. World J Pharm Res 2015; 4(2): 686-708. Patil SK, Dhage AN, Patil SV, Patil SS. Formulation and Evaluation of nasal in situ gel for Alzheimer’s disease. Int Res J Pharma Bio Sci 2015; 2(2): 41-58. Jouyban A, Soltanpour S, Acree WE. Improved prediction of drug solubilities in ethanol + water mixtures at various temperatures. Biomedicine Int 2010; 1: 19-24. Martins MT, Paim CS, Steppe M. LC and UV methods for lamotrigine determination in pharmaceutical formulation. Chromatogr Res Int 2011; 8. Viram P, Lumbhani AN. Development and Evaluation of ion dependent insitu nasal gelling system of metoclopramide hydrochloride as an antimigraine model drug. Int J Latest Res Sci Technol, 2012; 1(2): 80-9. Pavan KG, Prasad GS. Physicochemical properties of lamotrigine and its compatibility with various inactive ingredients to formulate lamotrigine orally disintegrating tablets. Int J Pharm Biol Arch 2013; 4(1): 94-5. Pathan IB, Nirkhea SR, Bairagib A. Insitu gel based on gellan gum as new carrier for nasal to brain delivery of venlafaxine hydrochloride: Invitro evaluation and invivo study. J Chem 2015; 7(9): 324-31. Kohda Y, Kobayashi H, Baba Y, Yuasa H, Ozeki T, Kanaya Y. Controlled release of lidocaine hydrochloride from buccal mucosa adhesive films with solid dispersion. Int J Pharm 1997; 158: 147-55. Jug M, Bećirević-Laćan M. Influence of hydroxypropyl-beta-cyclodextrin complexation on piroxicam release from buccoadhesive tablets. Eur J Pharm Sci 2004; 21(2-3): 251-60. Pagar SA, Shinkar1 DM, Saudagar RB. Development and evaluation of insitu nasal mucoadhesive gel of metoprolol succinate by using 3 2full factorial design. Int J Pharm Pharm Sci 2014; 6(11): 218-23. Patil PR, Salve VK, Thorat RU, Shahi SR. Formulation and evaluation of ion-sensitive insitu nasal gel of zolmitriptan. Int J Pharm Pharm Sci 2015; 7(1): 478-86. Nandgude T, Thube R, Jaiswal N, Deshmukh P, Chatap V, Hire N. Formulation and evaluation of pH induced in situ nasal gel of salbutamol sulphate. Int J Pharm Sci Nanotech 2008; 1: 177-82. Arigela B, Garikipathi P, Vaida AP, Nadikatha A, Sali R. Formulation and evaluation of floating oral in situ gel of oflaxacin for stomach specific delivery. World J Pharm Pharm Sci 2015; 4(2): 1144-56. Pathan IB, Chudiwal V, Farooqui I, Shingare P. Formulation design and evaluation of nasal insitu gel as a novel vehicle for azelastine hydrochloride. Int. J Drug Deliv 2013; 5(3): 284-90. Cai Z, Song X, Sun F, Yang Z, Hou S, Liu Z. Formulation and evaluation of in situ gelling systems for intranasal administration of gastrodin. AAPS PharmSciTech 2011; 12(4): 1102-9. Suppes T, Brown ES, McElroy SL, et al. Lamotrigine for the treatment of bipolar disorder: A clinical case series. J Affect Disord 1999; 53(1): 95-8. Gohel MC, Parikh RK, Nagori SA, Shah SN, Dabhi MR. Preparation and evaluation of soft gellan gum gel containing paracetamol. Indian J Pharm Sci 2009; 71(2): 120-4. Sun L, Yu T, Guo J, et al. The estrogenicity of methylparaben and ethylparaben at doses close to the acceptable daily intake in immature Sprague-Dawley rats. Sci Rep 2016; 6: 25173. Manisha R, Bhavna T, Manjula R. Insitu gel sustained nasal drug delivery. Int J Pharm Sci Res 2015; 6(1): 4958-66. Miller SC, Donovan MD. Effect of poloxamer 407 gels on the miotic activity of pilocarpine nitrate in rabbits. Int J Pharm 1982; 12: 142-52. Khan S. Review: Insitu gelling system. J. innovation Pharm. Biol Sci 2014; 1(2): 88-91. Kumar MV, Aravindram AS, Rohitash K, Gowda DV, Parjanya K. Formulation and evaluation of insitu gel of bromhexine hydrochloride for nasal delivery. Pharm Sin 2012; 3: 699-707. Hiremath SP, Dasankoppa FS, Nadaf A, et al. Aezazahmed, Nanjundaswamy, NG. Formulation and evaluation of a novel insitu gum based ophthalmic drug delivery system of linezolid. Sci Pharm 2008; 76: 515-32. Patel DM, Patel DK, Patel CN. Formulation & Evaluation of Floating Oral insitu Gelling system of Amoxicillin. Cario Int Sch Res Network 2011; 1: 1-8. Yellanki SK, Anna B, Krishan MR. Preparation of ocular insitu gel for glaucoma treatment using isolated Forskolin from coleus forskoli Root. Int J Res Dev Pharm Life Sci 2016; 5(1): 1981-5. Sherafudeen SP, Vasantha PV. Development and evaluation of in situ nasal gel formulations of loratadine. Res Pharm Sci 2015; 10(6): 466-76. Choi HG, Shim CK, Kim DD. Development of in situ gelling and mucoadhesive acetaminophen liquid suppository. Int J Pharm 1998; 165: 33-44. Harish NM, Prabhu P, Charyulu RN, Gulzar MA, Subrahmanyam EV. Formulation and evaluation of insitu gels containing clotrimazole for oral candidiasis. Indian J Pharm Sci 2009; 71(4): 421-7. Chand P, Chand P, Pratibha Gnanarajan G, Kothiyal P. In situ gel: A review. Indian J Pharma Biol Res 2016; 4(2): 11-9. Lei S, Cao Qi, Z, Zhang Xinguo J. Preparation of ion activated insitu gelling system of scopolamine hydrobromide & evaluation of its antimotion sickness efficiency. Acta Pharmacol Sin 2007; 28: 584-90. Mandal S, Thimmasetty MK, Prabhushankar G, Geetha M. Formulation and evaluation of an in situ gel-forming ophthalmic formulation of moxifloxacin hydrochloride. Int J Pharm Investig 2012; 2(2): 78-82. Shinde JS, Mali KK, Dias RJ, Havaldar VD, Mahajan NS. Insitu mucoadhesive nasal gels of metoclopramide hydrochloride: Preformulation and formulation studies. J Pharm Res 2008; 1: 88-96. Edsman K, Carlfors J, Petersson R. Rheological evaluation of poloxamer as an in situ gel for ophthalmic use. Eur J Pharm Sci 1998; 6(2): 105-12. Chelladurai S, Mishra M, Mishra B. Design and evaluation of bioadhesive in-situ nasal gel of ketorolac tromethamine. Chem Pharm Bull (Tokyo) 2008; 56(11): 1596-9. Carlfors J, Edsman K, Petersson R, Jörnving K. Rheological evaluation of Gelrite in situ gels for ophthalmic use. Eur J Pharm Sci 1998; 6(2): 113-9. Mohan EC, Kandukurni JM, Allenki V. Preparation and evaluation of insitu gels for ocular Drug Delivery. J Pharm Res 2009; 2(6): 1089-94. Makwana SB, Patel VA, Parmar SJ. Development and characterization of in-situ gel for ophthalmic formulation containing ciprofloxacin hydrochloride. Results Pharma Sci 2015; 6: 1-6. Humeed MD. Preparation and invitro characterisation of mucoadhesive polymeric microspheres as intranasal delivery systems. Eur J Pharm Biopharm 1997; 44: 53-60. Zaki NM, Awad GA. Mortoda, N.D.; Elrady. SSA. Enhanced Bioavailabilty of metoclopramide Hydrochloride by intraasal administraton of a mucoadhesive insitu gel with modulated Rheological and Mucocilliary Transport. Eur J Pharm Sci 2007; 32(4-5): 296-30. Kalia . Insitu Gelling System: A Review. J Drug Discovery Ther 2014; 4(4): 93-103. Madan JR, Adokar BR, Dua K. Development and evaluation of in situ gel of pregabalin. Int J Pharm Investig 2015; 5(4): 226-33. Jones DS, Woolfson AD, Brown AF, Coulter WA, McClelland C, Irwin CR. Design, characterisation and preliminary clinical evaluation of a novel mucoadhesive topical formulation containing tetracycline for the treatment of periodontal disease. J Control Release 2000; 67(2-3): 357-68. Frankland AW, Walker SR. A comparison of intranasal betamethasone valerate and sodium cromoglycate in seasonal allergic rhinitis. Clin Allergy 1975; 5(3): 295-300. Vibha B. Insitu gel nasal drug delivery. Int J Pharma Sci 2014; 4(3): 577-80. Harris AS, Hedner P, Vilhardt H. Nasal administration of desmopressin by spray and drops. J Pharm Pharmacol 1987; 39(11): 932-4. Rao MR, Shelar SU. Controlled release of ion sensitive floating oral insitu gel of a prokinetic drug using gellan gum. Indian J Pharm Edu Res 2015; 49(2): 158-69. Lee JW, Park JH, Robinson JR. Bioadhesive-based dosage forms: the next generation. J Pharm Sci 2000; 89(7): 850-66. Singh RM, Kumar A, Pathak K. Thermally triggered mucoadhesive in situ gel of loratadine: β-cyclodextrin complex for nasal delivery. AAPS PharmSciTech 2013; 14(1): 412-24. Mehta MR, Surve SA, Menon MS. Novel nasal insitu gelling system for treatment of sinusitis. Indian J Pharm Sci 2009; 71(6): 721-2. Bhalerao AV, Lonkar SL, Deshkar SS, Shirlokar SV, Despandae AD. Nasal mucoadhesive insitu gel of Ondansetron hydrochloride. Indian J Pharm Sci 2009; 71(6): 711-3. Shan RA, Mehta MR, Patel DM, Patel CN. Design and Optimization of Mucoadhesive nasal in situ gel containing sodium cromoglycate using factorial design 2011; 65-74. Basu S, Bandyopadhyay AK. Development and characterization of mucoadhesive in situ nasal gel of midazolam prepared with Ficus carica mucilage. AAPS PharmSciTech 2010; 11(3): 1223-31. Costa P, Sousa Lobo JM. Modeling and comparison of dissolution profiles. Eur J Pharm Sci 2001; 13(2): 123-33. Mahajan HS, Dinger SB. Design and Invitro evaluation of nanoemulsion for nasal delivery of artemether. Indian J Nov Drug Deliv 2011; 3(4): 272-7. Sapra P, Patel D, Soniwala M, Chavda J. Development and optimization of insitu periodontal gel containing levofloxacin for the treatment of periodontal disease. J Sci Innovation Res 2013; 2(3): 608-27. Sanjay R, Jigar V, Vijay P, Dhaval R. A review on in situ polymeric drug delivery system. Int J Drug Formulation Res 2011; 2(4): 143-68. Galgatte UC, Kumbhar AB, Chaudhari PD. Development of in situ gel for nasal delivery: Design, optimization, in vitro and in vivo evaluation. Drug Deliv 2014; 21(1): 62-73. Ibrahim MM, Sammour OA, Hammad MA, Megrab NA. In vitro evaluation of proniosomes as a drug carrier for flurbiprofen. AAPS PharmSciTech 2008; 9(3): 782-90. Smart JD, Kellaway SW, Worthigton HE. An invivo investigation of mucosa adhesive material for use in controlled drug delivery. J Pharm Phrmacol 1984; 36: 259-99. Nair AS, Vidhya KM, Saranya T, Sreelakshmy KR, Nair SC. Mucoadhesive buccal patch of cefixime trihydrate using biodegradable natural polymer. Int J Pharm Pharm Sci 2014; 6(6): 366-71. Khan S, Patil K, Bobade N, Yeole P, Gaikwad R. Formulation of intranasal mucoadhesive temperature-mediated in situ gel containing ropinirole and evaluation of brain targeting efficiency in rats. J Drug Target 2010; 18(3): 223-34. Khan N, Aqil M. Ameeduzzafar, Imam, SS. ; Ali, A. Development and evaluation of a novel in situ gel of sparfloxacin for sustained ocular drug delivery: Invitro and exvivo characterization. Pharm Dev Technol 2015; 20(6): 662-9. Guadalupe N, Elizabeth P, Luis M, Nestor M, David Q, Adriana G. Formulation and invitro, exvivo and invivo evaluation of elastic liposomes for transdermal delivery of ketorolac tromethamine. Int J Pharm 2011; 3: 954-70. Prarekh HB, Rishad J, Jivani NP, Patel LD, Makwana A, Karunal S. Novel insitu polymeric drug delivery system- A Review. J Drug Deliv Ther 2012; 2(5): 136-45. Jagdale S, Shewale N, Kuchekar BS. Optimization of thermoreversible in situ nasal gel of Timolol Maleate. Scientifica (Cairo) 2016; 2016: 6401267. Majithiya RJ, Ghosh PK, Umrethia ML, Murthy RS. Thermoreversible-mucoadhesive gel for nasal delivery of sumatriptan. AAPS PharmSciTech 2006; 7(3): 67. Bhandwalkar MJ, Avachat AM. Thermoreversible nasal in situ gel of venlafaxine hydrochloride: Formulation, characterization, and pharmacodynamic evaluation. AAPS PharmSciTech 2013; 14(1): 101-10. Sawant D, Dandagi PM, Gadad AP. Formulation and evaluation of sparfloxacin emulsomes- loaded thermosensitive in situ gel for ophthalmic delivery. J Sol-Gel Sci Technol 2016; 77(3): 654-65. Zhu L, Ao J, Li P. A novel in situ gel base of deacetylase gellan gum for sustained ophthalmic drug delivery of ketotifen: In vitro and in vivo evaluation. Drug Des Devel Ther 2015; 9: 3943-9. Cao SL, Ren XW, Zhang QZ, et al. In situ gel based on gellan gum as new carrier for nasal administration of mometasone furoate. Int J Pharm 2009; 365(1-2): 109-15.